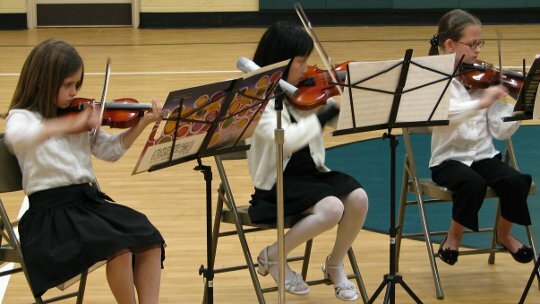 At Bannockburn Elementary School third grade is the year kids can start working with the school orchestra. Elisabeth decided she wanted to learn violin and this is her first performance. It was an extra special treat that Grandma and Grandpa were willing to drive over two hours to watch her play in the Winter Concert. By the way, “Run Pony Run Pony” and “Mississippi Hotdog” are two of the first bowing rhythms that students learn and both are used in this tune (I learned that at the concert). We think Director David Crane does a great job with the students.